Joined by Darius Campbell (Nick Arnstein), Nigel Barber (Florenz Ziegfeld), Zoë Ann Bown (Mrs. Meeker), Martin Callaghan (Mr. Keeney), Jennifer Harding (Emma), Rachel Izen (Mrs Brice), Joshua Lay (Eddie) and Myra Sands (Mrs. Strakosh); with Rhianne Alleyne, Kit Benjamin, Lloyd Davies, Flora Dawson, Joseph Dockree, Abigayle Honeywill, Brontë Lavine, David Mcintosh, Peter Nash, Gillian Parkhouse, Tom Partridge, Nova Skipp, Alexandra Waite-Roberts, Sam Wingfield and Alexandra Wright. 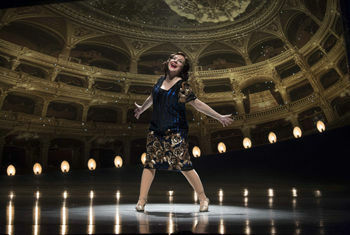 Sheridan Smith reprises her smash hit performance as Fanny Brice. Her other theatre work includes A Midsummer Night’s Dream (Michael Grandage Company at the Noel Coward Theatre), Hedda Gabler (Old Vic), Flare Path (Theatre Royal Haymarket – Olivier Award for Best Supporting Actress, Evening Standard Theatre Award and Critics’ Circle Theatre Award for Best Actress), Legally Blonde (Savoy Theatre – Olivier Award for Best Actress in a Musical), Tinderbox (Bush Theatre), The People are Friendly (Royal Court) and Into the Woods (Donmar Warehouse). For television, her credits include The Moorside Project, Blackwork, The C Word, Cilla, The Widower, The 7.39, Dates, Mr Stink, Mrs Biggs (BAFTA Award for Best Actress), Accused, Scapegoat, Little Crackers, Jonathan Creek, Gavin & Stacey, Larkrise to Candleford, Grown Ups, Love Soup, Two Pints of Larger and a Packet of Crisps, The Royle Family and Wives and Daughters; and for film, The Huntsman, Powder Room, Quartet, Tower Block and Hysteria. Please note, the producers of Funny Girl cannot guarantee the appearance of any particular artist, which is always subject to illness and holidays.